A new standard bearer has opened up in Fukushima. Though there is already plenty of ramen of high calibur in that area, Moeyo Mensuke decided to open up shop with a selection of fancy bowls. The two items available are duck shoyu, or golden shellfish shio. They both sounded good, but I had to go with the duck. 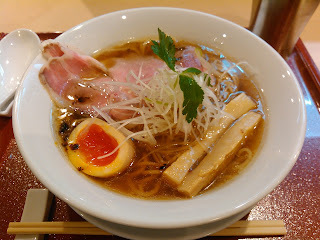 The base broth was a high quality refreshing shoyu with bit of woodiness and occasional bursts of yuzu citrus. The noodles were square, dark, and delicate. The chashu was simple with a bit of chew, and the duck was the most unusual part; dark and rich.